Call 614-322-3333, for a free design and quote on your patio today. Brick paving is the best alternative for an outdoor living surface. It comes in a number of different colors, sizes and textures. Our designer can come out to your house to give you a free quote which would include design ideas, construction methods, examples of our work and a drawing. We can add a beautiful matching set of stairs, fire pit or even a built-in grill/kitchen to any patio. 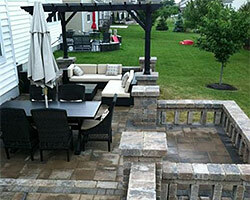 Ask our designer what else you can do to your patio to give it your own personal touch. You will constantly read and hear that home improvement is the best way to increase the resale value of your home. We couldn’t agree more. Rather than going for something expensive, have you thought of installing a patio? Patios increase the resale value of home by increase the living space. Your yard, which often is underrated, can be transformed in a functional place with something as simple as a patio. And, we at Creative Earthscapes have the skill, knowledge and expertise to help you achieve this goal. Whether you want to make an outdoor functional area or you want to extend your living room or dining area, we can help you conceptualize, design and build it. Enclosed patios offer you privacy and also great for winters, when the cold weather deters you from enjoying fresh air. You also have the option of having the patio attached to your home to extend the living space beyond the four walls of your house or keep it as a standalone structure. We can help you create just the patio you are looking for within your budget and ensure it serves its purpose – enhancing the curb appeal of your home. We can create one-of-a-kind patio designs for your home. Patios can be simple or complex, but whatever design you choose should be capable of whichever design you choose should be eye grabbing and completely in sync with the architecture of your home. Even a simple design can add unmatched elegance. Imagine creating a garden patio where you can spend time amidst lush greenery. Or we can build a lanai that seamlessly connects your home to your outdoor living space. A lanai patio also can be used as a leisure area, dining or even sleeping. You also can pavilion to entertain large crowds or have a smaller one for communing with nature. 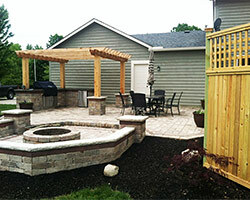 We also have the expertise to add stairs, fire pit or built-in kitchen to your patio. Our designs are unique and can easily be customized to suit your taste and budget, so that your patio is a reflection of your personality. Designing and building a unique patio requires skill, knowledge and experience. 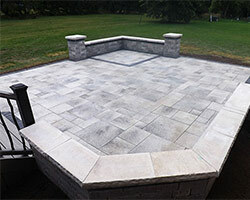 We at Creative Earthscapes have these attributes and are well placed to create mesmerizing and unique patios that will fit seamlessly with the architecture of your home and increase your home’s resale value. Located at Morrison Rd, Columbus, Ohio, we have been designing and building breathtaking patios throughout central Ohio, including, Pickerington, Westerville, Genoa Township, Worthington and Bexleyl. We are one of the leading patio builders in the area and take pride in our high quality raw materials and exceptional workmanship. The success of your patio design and construction will depend on choosing the right builder and that is why you should give us a call on (614) 322-3333 today. Our designers will visit your home based on your convenience and provide you will a free quote, design ideas and images of our previous work. We are positive that you will love our creative and innovative patio designs.